“In 2011, the Israeli government destroyed 22 Palestinian homes in East Jerusalem, displacing 88 Palestinians. In the same year, the Israeli government destroyed a total of 222 Palestinian homes across the West Bank and Gaza, displacing 1,094 Palestinians." Housing demolitions break apart families, push children into homelessness, and destroy livelihoods. And yet many people can read these statistics without feeling much of anything. As social scientists will tell you, most people are not moved by raw data alone. This fact, combined with mainstream apathy toward the plight of Palestinian people, strips the humanity from these housing demolition statistics. The infographic weaves text, graphics, and iconography together to craft a powerful narrative. The viewer’s journey begins at the top of the visualization, where the figures are the smallest (in East Jerusalem in 2011, the Israeli government demolished 22 Palestinian homes, making 88 people homeless). The illustration accompanying these figures depicts a handful of houses – perhaps enough to make up a city block. As the viewer’s eye moves down the page, it encounters a startling jump. 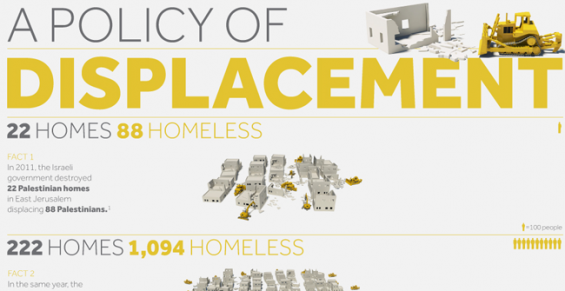 The numbers multiply exponentially (222 homes/ 1,094 homeless; 4,455 homes/ 20,000+ homeless; 25,000 homes/ 160,000+ homeless), as does the visual scale of the destruction. The city block becomes a neighbourhood, then a cluster of neighbourhoods, and finally, an entire city. Look closely and you’ll see bulldozers and fighter jets frozen in the act of destroying these homes, as if to tell the viewer: this is all happening right now. By the final section, the icons representing displaced people (100 people per icon) overwhelm the visual frame. The viewer is left feeling unsettled -- an emotion that can be a critical first step toward changing perceptions and beliefs. 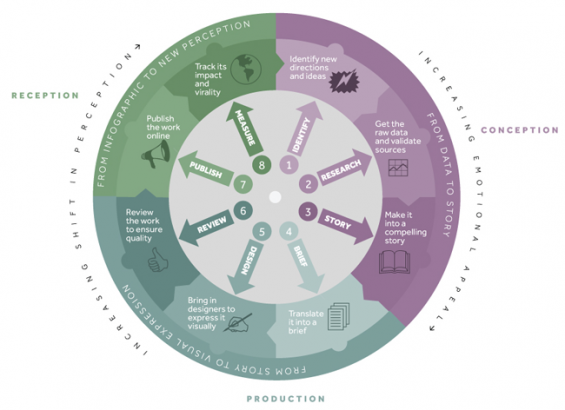 Visualizing Impact (VI) is a pioneer within the field of data visualization. The infographic above is part of its Visualizing Palestine (VP) project, which is dedicated to creating “data-driven tools to advance a factual, rights-based narrative of the Palestinian-Israeli issue.” Each piece elevates a distinct perspective that has been silenced within mainstream discourse. A well-told story can change the way we understand the world -- and that’s why visual storytelling is such a powerful tool for the nonprofit sector. “Data visualization takes something very complex and makes it understandable and accessible,” says Jessica Anderson, co-founder of VI. A visual journey establishes an emotional bond with the viewer, enabling the storyteller to deliver messages that resonate on a deeper level than might otherwise be possible. VI offers a compelling case study in how visual storytelling can mobilize community members, shift mainstream narratives, engage donors, and influence policymakers. In 2011, Ramzi Jaber and Joumana al Jabri were organizing TEDxRamallah, and in planning the event, Ramzi discovered a number of thoroughly researched reports related to human rights in Palestine. This was surprising -- Ramzi considered himself to be well-informed, but here was a world of compelling data he had never seen before. Clearly, there was a tremendous amount of rich, insightful data was not being utilized to its full potential. Indeed, this gap between research and impact is endemic across sectors. For example, the World Bank spends millions of dollars on publishing research-based reports aimed at “informing the public debate or influencing the development community.” And yet in 2014, the World Bank revealed that 31 percent of its reports had never been downloaded by the public, and 87 percent had never even been cited. What would it take to translate existing data into impact on policy and public opinion? How could activists and educators use data to effect real change? To answer these questions, Ramzi and Joumana began to experiment with visual storytelling. At the time, the plight of Palestinian political prisoner Khader Adnan was gaining attention around the world. Having been detained in Israeli prison without charge or trial, Adnan was in the midst of hunger strike that would last a staggering two months. The nascent VI team wanted to situate Adnan’s story within a broader narrative of historical political dissent, so they began to doing research around two main topics: the history of hunger-striking as a tactic of protest, and the effects of hunger on the human body. The team then used key points from each data set to design its first visualization: a day-by-day timeline that interweaves the physiological effects of hunger-striking with the stories of the world’s most famous hunger strikers. The visual impact of this timeline is powerful: Nelson Mandela’s hunger strike ends at Day 7, muscle tissue starts breaking down on Day 14, Mahatma Gandhi’s longest strike ends on Day 21, and after day 45, blindness, deafness, and cardiovascular collapse can occur at any point. Adnan’s strike lasts until Day 66. 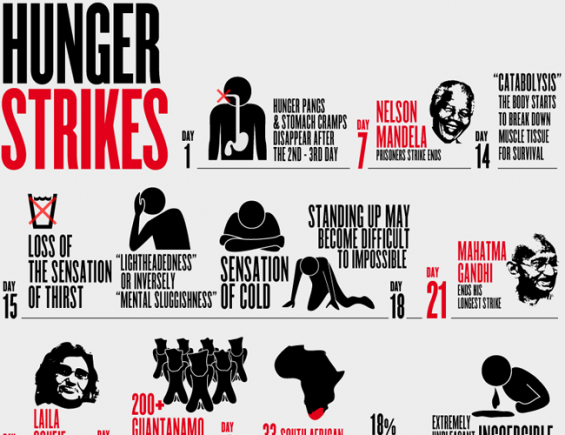 “Hunger Strikes” was published in 2012, and since then, it has been shared hundreds of times by reporters, activists, designers, and social media users. As the VI team found their footing, they began to apply their creative process to other concepts. Over the past five years, VI has published dozens of visualizations, telling critical stories around issues such as the water crises in Gaza and the West Bank, restrictions on Palestinian mobility, and the lack of accountability for civilian deaths during Israel’s military assaults on Gaza. The focus is not just on Palestine -- the VI team has also taken on issues such as media censorship in Egypt, income disparity between politicians and civilians around the world, and youth unemployment in the Middle East/ North Africa (MENA) region. VI makes their visualizations available for download at no cost for anyone who wishes to use them via a Creative Commons license. The visualizations are now regular features in activist, academic, and media spaces where the goal is to shine a light on non-dominant narratives -- they’ve even appeared on mobile billboards and public transit ad spaces in Washington, DC. Data visualization "is a great way to make otherwise boring numbers mean something to an audience." And because each visualization is also work of art, VI sells posters and coasters featuring their creative work through an online boutique, which also provides the organization an extra revenue stream. The stakes are high for the organization. First and foremost, VI must remain accountable to the people whose stories it seeks to amplify, especially with regard to their VP portfolio. A shift in public opinion could mean the difference between life and death for many Palestinians. VI also takes on issues that trigger intense emotional and ideological debates, and therefore must always deliver factual narratives that are driven by credible, transparent data sources and framed around existing human rights law. According to co-founder Ramzi Jaber, “data visualization is as much an art as it is a science,” one that requires creativity, collaboration, transparency and diligence. To ensure that all the pieces come together, the team follows a multi-layered creative process. The process follows the stages below. (Follow the hyperlinks to access invaluable research and design tools that VP/VI makes available for free). Both Jessica and Ramzi emphasize that the entire process is a team effort. A visualization comes to life in the lively back-and-forth exchanges between researchers, designers, project managers, translator, and anyone else with a stake in the project. Team members bounce questions off of one another such as: what story does the data tell? What tone would be the most compelling – serious, playful, or otherwise? Where do we want the eye to travel? Without the text, does the visualization still convey our message? This kind of collaborative creativity is inherently fluid and messy. And while, from an efficiency perspective, it might be tempting to institute a rigid, formulaic collaborative process, the results would not be the same. These are complex stories being designed for a multi-faceted and diverse audience -- and this requires a dynamic and vibrant creative process. Of course, having the right tech systems in place can go a long way in making collaboration functional, especially for a team as geographically diverse as this one. VI uses Slack for internal instant messaging and Basecamp and Jira for project management. And given the sometimes unstable nature of internet-based communications, VI incorporates contingency planning into its tech strategy. For example, if Skype is not working properly, the team uses GoToMeeting as a Plan B for VoIP-based communications (and vice versa). It takes agility and strategic thinking to ensure that the team always remains connected. But even the best tools will fall flat if they’re not being used in ways that address the needs of the team. With people scattered all over the globe, it’s important to strike a balance between autonomy and support. For example, weekly check-ins go a long way toward helping keep everyone on track to hit their milestones. However, because multiple and random calls can disrupt workflow, VI clusters meetings on designated weekdays. Ensuring that your team can thrive in a decentralized culture such as VI’s begins at the hiring process, but it doesn’t end there. You need to constantly evaluate and respond to the needs of your people so that everyone is able to do their best work. Iman Annab is project manager in VI's Toronto office. We asked her what advice she might give to other nonprofits considering using data visualization as a tool for advancing their missions. Dataviz is a communication aid/tool, and just like any other, one would need to craft a compelling story, whether it is to persuade or to simply to inform. The dataviz process demands strong conceptualization, thorough research and data collection, coupled with precise language and visual creativity. It is a great way to make otherwise boring numbers mean something to an audience. My advice would be to be diligent in data collection and cataloguing sources of data/research and spend time reading the data to find what stories it is telling. Make it work for you and your mission. VI's creative depiction of youth unemployment in Middle East/ North Africa -- click to view full image. VI helped pioneer the field of data visualization -- a field that has now expanded into the mainstream. And while Ramzi is happy that data visualization has become common and prevalent, he recognizes the need for VI to “continue being on the deep-end.” That means going deeper into data sources, experimenting with new distribution models, and pursuing new and innovative media formats. The organization is also considering new sources of revenue generation, from a subscription-based model to offering paid research and development services. Meanwhile, the team is applying its creative process to other pressing issues. For example, VI has partnered with Electronic Frontier Foundation to launch onlinecensorship.org, a website that tracks and visualizes data around the social media censorship; the project also provides resources for journalists covering social media issues such as fake news, hate speech, and censorship of the human body. There is never a shortage of stories to tell – that’s as true for VI as it is for your organization. And while data visualization can be a very engaging storytelling tool, there are countless other formats that can help you convey information in equally compelling ways. In other words, the format is a means to an end; the stories themselves are what matter. Stories form the bond between you and your mission. When you tell these stories in a responsible, respectful way, you invite the audience to make that bond their own.